Regardless who wins, we are assured logical, informed, independent thinking will prevail. The most interesting column, however, The Police Log, tells us that Tues. at 9:06 AM, on the corner of Crescent and Lakeshore, a driving complaint was reported from the previous day, presumed to be road rage. Our next stop. Bessemer, MI, to inspect a “restored” 1965 M-Benz 4dr sedan that had failed to sell on eBay. It was a total piece of cr@p, bondo in and out the w@zoo, & poorly finished in a gawdawful metallic diamond blue by a biker on meth. It would be worth his $3000 asking price if he left $2500 in cash, stuffed in the trunk, with his lab supplies. Ashland, WI, on the south shore of Lake Superior, ‘Gateway to the Apostle Islands’. The municipal park and campground, strategically located on a stunning stretch of beach, marina, and waterfront splendor of swans, is in the shadow of the famed Ashland Oardock. Built from 1914-1916, it extends 1800 feet into Lake Superior, and was capable of loading large freighter ships faster than a Geico commercial. The Kreher Park also had a celebrity trailer visitor, the famed Ultra-Van (Hutchinson, KS), featured on the Travel Channel’s hour long special of vintage RVs. Custom-crafted on a chevy corvair chassis, it stood out like a rock star amid karaoke wannabees. If you want to be noticed, this unit was the pheromone of the motorhome world…a steady stream of gawkers looking under your skirt. Sweet, it resembles the Oscar Mayer Weinermobile without the mustard and bun. Back to that political race, I wouldn’t vote for either of those guys even if they did all the things they promised. However, if they could eliminate road rage……..
Leaving the cabin sanctuary in DeTour, Lynn, Jack, and I head westward across the upper peninsula to fulfill an obligation in Minnesota five days hence. The blue highway route along MI-2 skirts the northern shore of Lake Michigan; small towns, scenic turnouts, lumber trucks, and pastie shops. At MI-77 we turn north toward today’s goal, Blaney Park, to dissolve seventy years of progress and relive those thrilling days of yesteryear. A warm day, but not uncomfortable, envelops this small well-worn town, pop. ~ 50, figuratively in the middle of nowhere.Several compulsory antique shops are dotted among the vestige of forgotten glory; an empty olympic size pool with a stagnant pond of algae and tar paper residue, an overgrown netless tennis court, moss covered shuffleboard lanes, and a cedar grove that once served as a golf driving range. In the midst is the fully operational Blaney Park Lodge, little changed from 1940, run by an elderly couple in their 80s. Here’s the kicker. Howard still offers rooms with private baths, for two people, at $39 a night. But wait, there’s more. This includes homemade breakfast and fresh coffee in the morning. And pie and ice cream in the evening. Who needs the Hampton Inn ? This area, and 33,000 acres, was once, in the late 20s, the home of a large timber operation. The lodge was built to accommodate the lumbermen, and when abandoned, became an upscale resort for returning WWII veterans, complete with an airstrip for practice pilot training and room for thirty planes. A few miles north is the incomparable, Seney National Wildlife Refuge, 96,000 acres of untouched primitive great lakes watershed and forest. Imagine, 150 square miles, unmolested. On to MI-28 at Seney, MI, where it stretches westward to Shingleton, MI for 25 miles without a single bend in the road. Reputed to be the straightest (and most boring) section of highway east of the Mississippi, uninterrupted, all you need is cruise control and auto pilot and you can take a half hour nap while driving. Next stop, Marquette, MI, on the south shore of Lake Superior. fifteen minutes may save you 15% on car insurance, if Sally Fields bones don’t petrify from an overdose of Boniva during the commercial break. Do third tier celebrities with cheap cosmetic surgery really lose weight on the UPS delivered diet plans, and if so, why does the 99 pound Oprah (as seen in her “O” magazine) appear to be a morbidly obese Charles Barkley in drag everyday at 4 PM ? Perhaps I need to turn off the TV. Like the nearly 400 million Americans who aren’t on the guest list for Chelsea Clinton’s wedding this weekend, we have selected an alternate entertainment venue. Apparently neither she, nor her ambassador mother Hillary, had the foresight to register at Target or Sam’s Club, so we can take the money otherwise reserved for her elaborate shower gift and head west to Saint Ignace for fun, fudge, and ice cream. 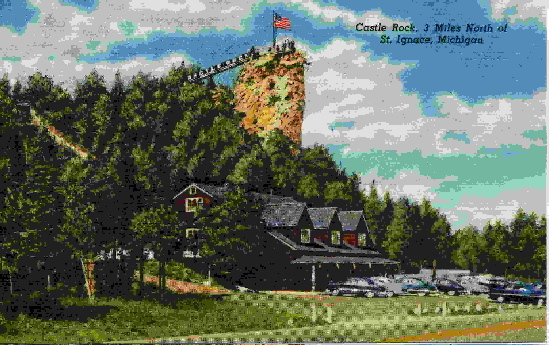 Saint Ignace, aside from being the gateway to Mackinac Island (#1 tourist attraction in the state of Michigan), is also home to the Castle Rock. 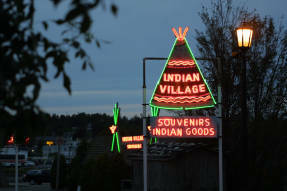 and Indian Village, America’s oldest souvenir shop founded ~ 1797. Or whenever the neon teepee was first introduced. They have the best summer car show south of Canada and north of Minneapolis. Above, an Amphicar, a failed project in the 50s. Both a car and a boat, it was sore excuse for either. The now slow recovering Michigan economy can still provide cheap thrills. In St. Ignace you can buy homes with water views, on the water, or in the water for next to nothing, except that you must endure a month of spring, a month of fall, and seven months of winter. It’s nearing four o’clock, time to tune in to the Oprah show for the newest buzzword, “teachable moment” ( find two better words in the English language that can convincingly signal saccharine insincerity.) It will either be about food, women, and God, or the latest fad diet, ‘how to lose forty pounds by Friday eating four minute fondue’.